Its that time of the year when it seems that the sunshine has long disappeared and the days are grey, it is so easy to get a little downhearted, especially when the dullness means lights need to be turned on early in the day. It is when I find it more important to search for simple pleasures and one of mine is tea. Firstly I love proper leaf first blush assam tea, you can get it from a wonderful tea importer in Portsmouth called All About Tea he even has a little email tea course you can follow with links on youtube all about how to make the best cup of tea. Assam has a strong earthy flavour, and a lovely golden colour often labelled English Breakfast tea. If you prefer something a little more gentle then Darjeeling is a lovely tea but don’t expect a dark colour its pale but packs a punch. Tea pots have a glory all of their own, generously pot bellied offering up all sorts of opportunities to keep warm with a knitted cosy. I prefer to use a metal strainer which gives the leaves freedom but makes it easy to lift out once the required strength is reached, so the second, or even the third cup of tea is just as good as the first and not stewed. 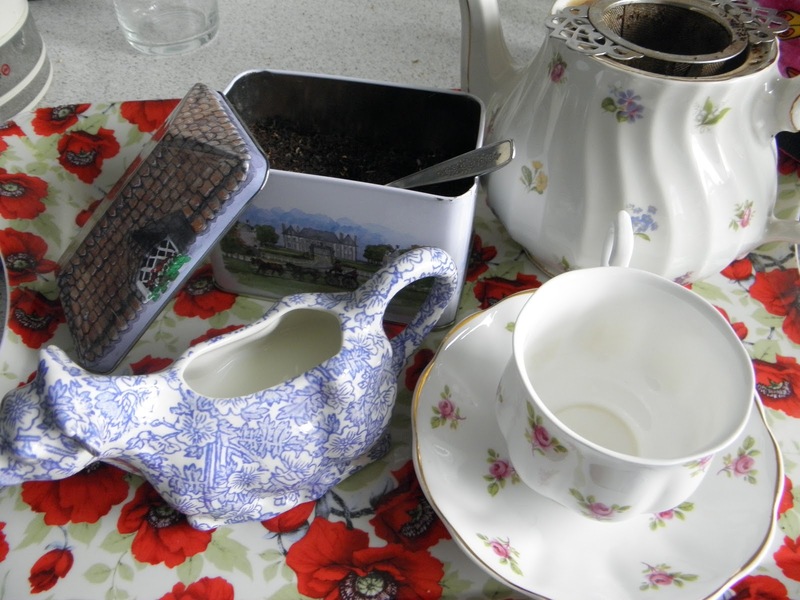 One of my most favourite ways to have tea is from my little china cups, it feels decadent the tiny china cups are so delicate I love the little rosebuds and they are designed so that the tea is at the optimum temperature to enjoy almost straight away. I cannot help but grin when I serve the milk from this gorgeous cow creamer, the milk comes out of his mouth! It is a Burleigh design, I simply adore their take on blue and white china from the deep indigo of the calico range to the pale Victorian chintz. Sitting enjoying my cup of tea, especially if it is with a friend or two, reminds me of the many years of practice I had when I was a child playing with my little tea sets. I don’t recall any child who likes to make their tea in a mug with a bag give me tea sets any day. Now that is a very good way to cheer up a November day. 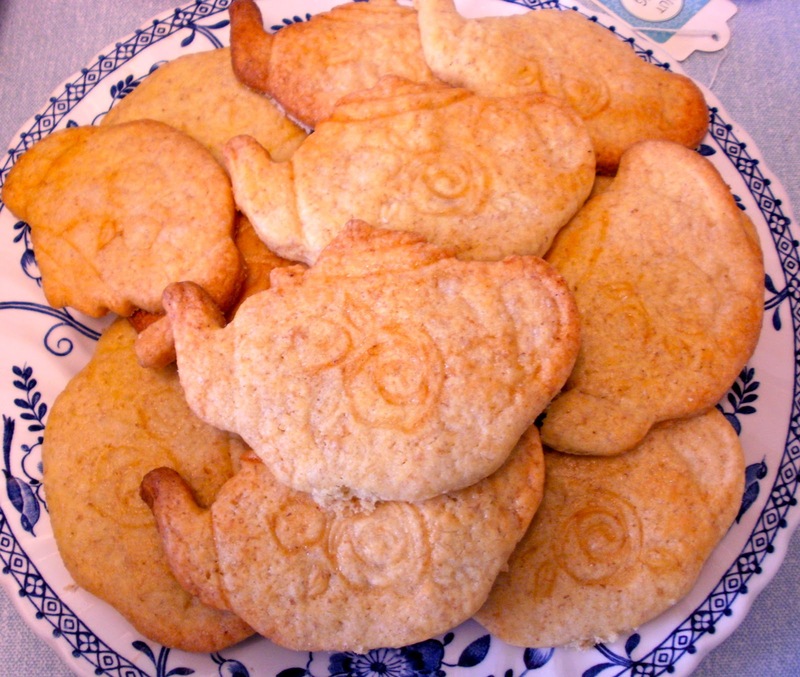 I saw this lovely teapot cookie cutter in TK Max the other week and I could not wait to try it out. It is made up of two pieces one is the teapot shape cutter and the other is a stamp you press out. There is nothing to beat the flavour of buttery biscuits hot from the oven and this recipe can be made ahead of time, stored in the freezer so that when friends drop round unexpectedly, they can be hot on the plate in under twenty minutes, definitely one of those domestic goddess moments with minimal effort. Pressing the stamps in the dough feels like child’s play and so much fun sheer domestic bliss! 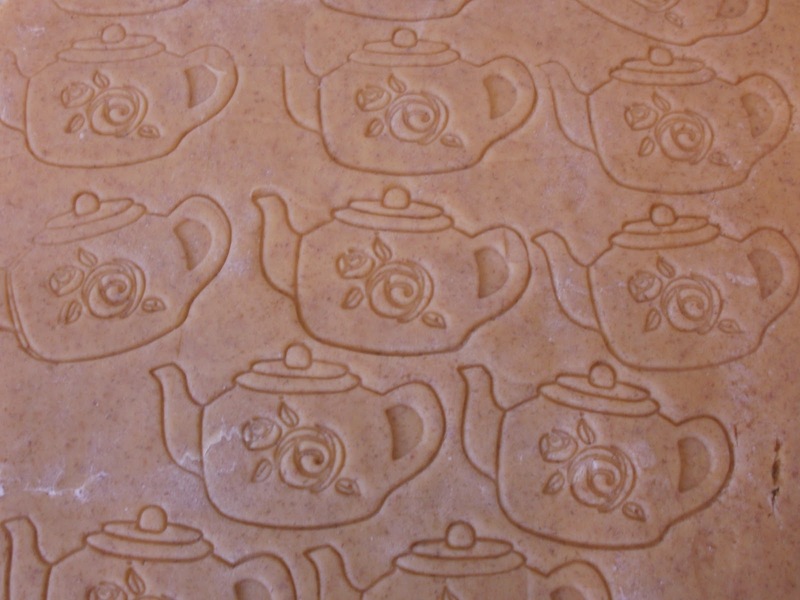 If you can’t get hold of your own teapot biscuit cutter, why not use a stamp from you craft collection, (you can use a surface sanitiser if you need to, but they will be in a hot oven to kill off any bugs!) There are some wonderful Christmas stamps out that look beautiful stamped across a heart shaped biscuit. They would make lovely home made gifts that are sure to be appreciated. Press the stamps into the dough and then carefully cut round each shape, transfer to a buttered baking tray, wash with egg white and then sprinkle with extra fine/caster sugar. Let the biscuits firm up in the fridge for 10 – 15 minutes before placing in a moderate oven about gas mark 4, 180c or 350F until golden brown.